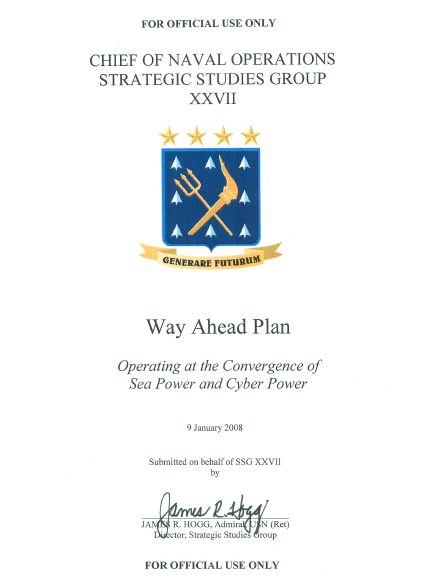 This plan outlines the Chief of Naval Operations’ (CNO) Strategic Studies Group (SSG) XXVIFs approach to addressing the challenges of operating at the convergence of Sea Power and Cyber Power as presented in the CNO’s Theme. In addition to providing a framework for the approach, this plan presents SSG XXVIFs initial overarching concept and Concept Team (CT) areas of focus. SSG XXVII convened in Newport, Rhode Island on 1 October 2007. The ten CNO Fellows and eight Technology Fellows experienced in-depth exposure to various conceptual thinking techniques, analytical methods, science, technology, and approaches for successful innovation. This portion of the SSG process established a common knowledge base through a robust exploration of various topics presented by leading figures from industry, academia, government, and national laboratories. Complemented by 14 Associate Fellows from the Naval War College and Naval Postgraduate School in December, SSG XXVII will continue its work through the spring of 2008, generating revolutionary concepts for near- and far-term implementation. The Group will report out to the CNO in July 2008. 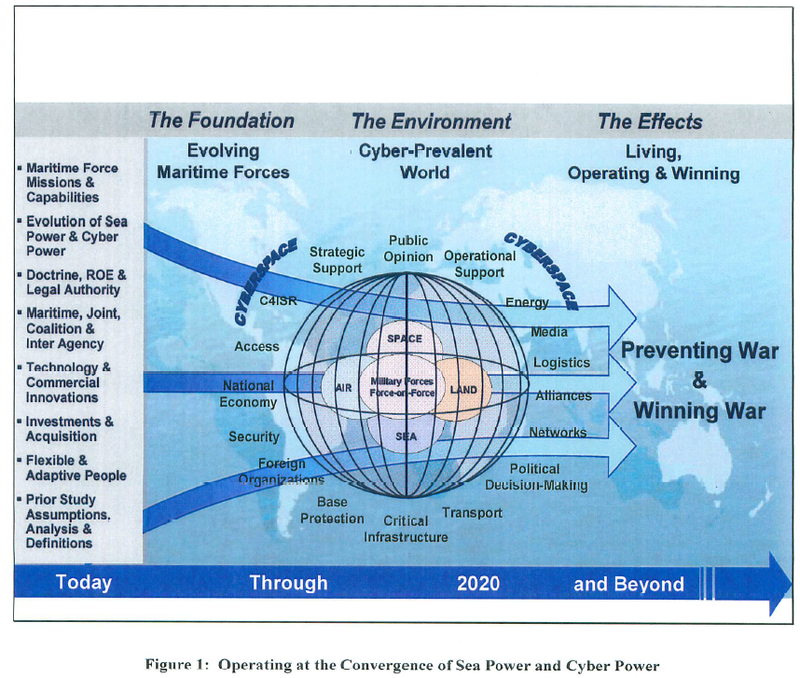 In 2006, the CNO challenged SSG XXVI to explore “fighting in cyberspace in 2030” and to establish a means to tie together the broader dimensions of Interagency, United Nations, Non-governmental organizations, and local government with the Navy to achieve the full spectrum of influence in 2030. Envisioning the Navy operating at the “convergence of Sea Power and Cyber Power,” SSG XXVI foresaw a world where the speed and availability of information changed the employment of Maritime Forces and the calculus of power projection. SSG XXVI concluded the Navy would maintain its distinctive role as the nation’s persistent forward presence force in a world of pervasive networks and cyber-integrated battlefields, especially within “the last tactical mile.” Moreover, they found that in a “hyper-globalized” world of 2030, the Navy would metaphorically patrol the global commons of cyberspace while maintaining the strategic underpinnings of power projection, sea control, strategic deterrence, naval presence, and strategic lift. SSG XXVFs revolutionary concepts were Global Reach Forward, Virtually Enabled Operations, and necessary enabling concepts. Global Reach Forward focused on building awareness, capacity, and influence through a combination of virtual and physical presence to enhance coalition operations. Virtually Enabled Operations provided for real-time modeling of the battlespace by fusing information from sensors, weapons, and warriors in virtual environments. The enabling concepts included the use of ubiquitous distributed sensors across the battlespace, advanced decision aids for the commander and staff, establishment of cyber-warfare as a primary warfare area, and national level unity of effort regarding cyberspace across all agencies. Focusing through 2020 and beyond, the CNO directed SSG XXVII to generate revolutionary concepts to integrate “physical-world and cyber-world capabilities into a seamless continuum of Sea Power.” SSG XXVII will build upon the intellectual foundation of SSG XXVI and previous SSGs, identify successes and remaining challenges, and recommend how the Navy should close the gaps. The CNO’s Theme reflects that in the future all aspects of warfare, including the prevention of conflict, will be cyber-enabled. Future Maritime Forces will employ a full range of advanced information, communication, and computing technologies. Maritime Forces will shape the strategic environment to build and sustain peace while maintaining the ability to have a decisive impact on crises and conflicts. SSG XXVII will produce actionable concepts; recommend broad and rapid experimentation to validate those concepts; and inform near-, mid-, and long-term program decisions supporting the concepts. The Group’s work will be delivered in an operational context grounded in the human element, with synergy across the physical, information, cognitive, and social domains. It will include recommendations on manpower and equipment requirements while addressing on how the Navy should develop its people to stay relevant and succeed in employing future maritime strategies. The Group will generate roadmaps for demonstrating, maturing, and capturing promising architectures, processes, and technologies supporting these revolutionary concepts.